Bookburners is a just-launched episodic fiction project by new publisher Serial Box, the first of their season- and episode-based “shows” (for lack of a better term!) brought to us by all-star teams of writers in collaborative fashion. In Bookburners, “Magic is real, and hungry—trapped in ancient texts and artifacts, only a few who discover it survive to fight back. Detective Sal Brooks is a survivor. Freshly awake to just what dangers are lurking, she joins a Vatican-backed black-ops anti-magic squad: Team Three of the Societas Librorum Occultorum. Together they stand between humanity and magical apocalypse. Some call them the Bookburners. They don’t like the label.” The series is written by Max Gladstone, Margaret Dunlap, Mur Lafferty, and Brian Francis Slattery, with a set of fantastic cover art by Mark Weaver and Jeffrey Veregge, and performed in audio by Xe Sands. As the audio is being released concurrently with the weekly episodes, it’s a perfect project to take on in classic AudioBookaneers “Listen-a-Long” fashion, as we’ve done for John Scalzi’s The Human Division and Mur Lafferty’s The Shambling Guide to New York City. With the second episode already out (Slattery’s “Anywhere But Here”) I’m starting juuuust a bit late, but don’t worry. At between an hour and an hour and a half per episode, I — and you! — can catch up. (And, hey, this first one’s free.) All right, enough preamble. Let’s go! Though the execution had a couple of flaws (one can suspend one’s disbelief about the existence of sentient books, sure, but some bits of police and other procedure and action begged my credulity a bit too hard) as a pilot episode, it works quite well. We open with Detective Sal Brooks, home after a tough day on the job — finding severed fingers wedged into an ash tray tends to dampen one’s feelings that the world is an overall decent place. Though all she wants is to spend the evening quietly, her brother Perry has other ideas, barging in his trademark fashion into her already ruined day with an ancient tome under his arm. And the “Bookburners” on his tail, warning Sal to not let her brother open the book. Which, of course, this being a story about bad things happening because people open the wrong books, Perry does. Unfortunately, he’s picked a spectacularly wrong book to open, and (almost literally) all hell breaks loose. Trying to find Perry in the aftermath, she joins forces with those aforementioned “Bookburners”, ad we meet Father Arturo Menchú, Liam, and Grace, a varied group, each with their own, ah, particular set of skills. Audie Award winning narrator Xe Sands is really quite good on this, with accents ranging from Vatican City to Ireland and of course NYC Detective Sal Brooks — though this she plays more neutral, thankfully, rather than some caricature which would wear quite thin as she’s the lead point-of-view character here. Unfortunately Gladstone doesn’t set Sands up with the chance to go for truly demonic vocal gymnastics, but we can hold out hope for future episodes. Before the end, we get a quite well-done encounter with a fairly terrifically creepy rebar homunculus; a battle in a Newark self-storage facility; and a final chapter with some downright beautiful turns of phrase (“Rooms shape the feelings within”) and of course, the closing quote from Father Arturo we’ve been waiting for: “Welcome to the team.” Team in place, mission parameters more or less set, we’ve got our quartet of book-hunters ready to defend the unsuspecting world from evil in future episodes. And this is where it’s got to get interesting for the project to work: episodic fiction more or less returns to the “level set” neutral position after each adventure, but knowing these authors we shouldn’t count on formula to save our heroes, if they’re safe at all. I’m a pretty big fan of both Lafferty (Afterlife series, The Shambling Guides, etc.) and Gladstone (read his novel Three Parts Dead and his short story “Kiss With Teeth” right now!) and haven’t read much Slattery, though enough to know he’s quite different than either writer, and I haven’t read anything by Dunlap previously. I’m intrigued by what the varied mix of creators will bring on “their” episodes. Trying to sign up using my Twitter account, and the permissions the OAuth gateway wanted included posting tweets for me; I canceled back out of that and was able to sign up using my Facebook account instead, which didn’t ask for any posting permissions. I might suggest Serial Box check on the permissions that the Twitter app is asking for, as I couldn’t see why they would need to post Tweets as me. UPDATE: They’ve actually already fixed this! I’m trying to figure out how to “consume” the audio editions (as this is what I subscribed for); there doesn’t appear to be an app, or is there some way to (say a unique for me podcast URL) to download new episodes easily. As it stands, it looks like I have to a) download the file b) add the file to iTunes c) add author and album tags and download and add the book cover to the file d) connect my iPod via a cable to my PC e) sync, all of which seems decidedly pre-2015. I’d really like an easier way to “just get” the new audio episodes on my iPod. (I know, some of that is iOS being locked in and not just allowing raw downloads, etc. but it’s also a pain.) Yeah, one can sit and listen at one’s computer, and you can click and listen to the episode inside the mobile browser, but then you’re modally locked from visiting any other website, and likely to have your listening place lost as there’s no “bookmark” or similar feature there. UPDATE: So, yeah, there actually is an iOS app; I’ll be checking that out in more detail in the next episode, but in brief, yup, I can download and listen to the episodes with it, directly to my phone, so. Yeah. Oops! But these are nit picks for an experience still in “Beta”, and overall the website/ebook/audio experience is top-notch, from production values to typography, and they’ve got time to tinker and make things even better, and they’ve got every indication of doing so, with Ellen Kushner’s Tremontaine coming soon, based and set in the world of her “Riverside” series of novels. For that one, the pilot episode is due October 28. Dave, fancy a listen-a-long of your own? 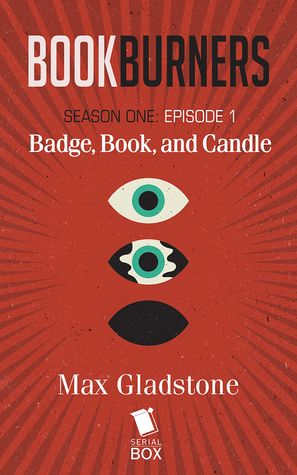 This entry was posted in The Bookburners Listen-a-Long and tagged bookburners, max gladstone, serial box, xe sands. Bookmark the permalink.